Figure 1. The authors hypothesize the above local circuit connections to and from the medial olfactory bulb (MOB) based on data they added to the whole brain connectivity atlas. From Figure 8 in “Comprehensive connectivity of the mouse main olfactory bulb: analysis and online digital atlas” (published August 7, 2012 in Frontiers in Neuroanatomy). The recent paper “Comprehensive connectivity of the mouse main olfactory bulb: analysis and online digital atlas” (published August 7, 2012 in Frontiers in Neuroanatomy) introduced the first olfactory (sense of smell) mouse brain connectivity data available as an open resource in the Mouse Connectome Project online database. And not from just any mouse, but from the C57BL/6J mouse. The C57 black 6 mouse (C57BL/6J) is the most common genetic strain of mouse used in biomedical research today. The Mouse Connectome Project’s publicly available whole brain connectivity atlas of the C57BL/6J mouse is being created to help provide data for generating testable ideas (hypotheses) about local brain circuits, brain function, behavior, and disease. The project provides data through the following link: http://www.mouseconnectome.org/iConnectome (see Figure 2 below). Figure 2. This webpage is the access point to the Mouse Connectome Project’s data repository. The page lists the data and data characteristics which are viewed through the iConnectome Viewer (see text below). There is no direct access to the raw data that I can find. Instead a tool named the iConnectome Viewer is provided. The user selects the data set they want to work with by checking the check box in the left-most column titled “Show” and then clicking on the “VIEW” button above. The paper includes several figures that display data which lead the authors to hypothesize connections to and from the medial olfactory bulb (MOB) shown above in Figure 1. The beauty of shared data access begins to become apparent on noticing the case numbers referencing the data included in each figure caption. Case numbers are listed in the Mouse Connectome Project data repository webpage in the column next to Show (see Figure 2 above). Type a case number into the Search box (under the “REFRESH” button at the far right and at the same level as the “VIEW” button) and the case list shrinks. I typed in case SW110403-01A from the paper’s Figure 7E-H into the search box, checked the check box next to the case number, and then clicked the “VIEW” button. An impressive looking viewer appeared, as shown in Figure 3 below. Figure 3. 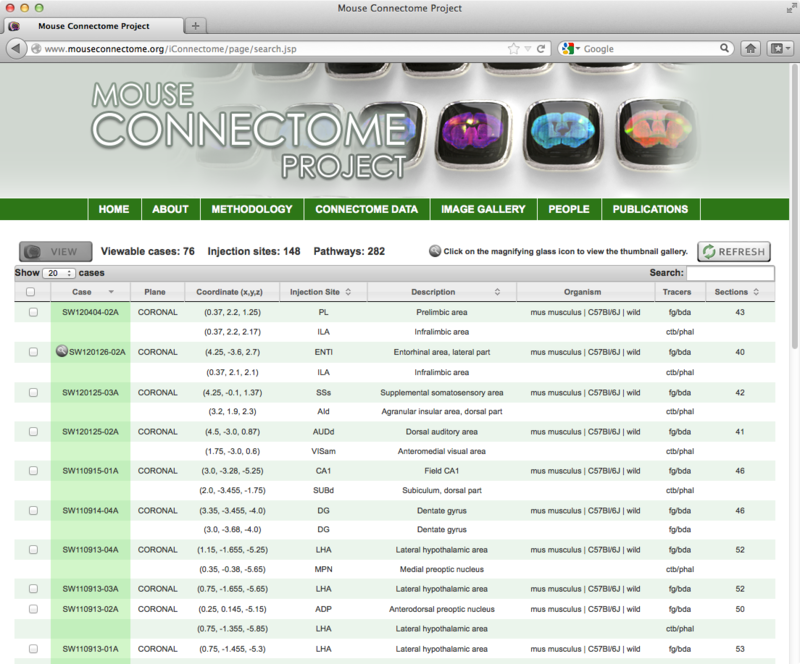 The iConnectome Viewer displays the data contained in the Mouse Connectome Project’s whole brain connectivity atlas. There are five main areas of the iConnectome Viewer. The navigation controls are grouped in upper left hand area. This area provides controls for zooming, panning, and refreshing the selected viewport (the viewer opens with one viewport but it may show up to four viewports at a time). Most navigation functions may also be accomplished through double-clicking, dragging, and other interface gestures. There is also a thumbnail view of the section in the currently selected viewport shown here. There is one set of navigation controls for all open viewports. The data set and layer controls appear in the upper right portion of each open viewport. The case number of the data displayed in the viewport is displayed above a list of data types that may be layered one upon the other. The base layer that displays a standard Nissl stained section is selected by default. Above the base layer is the atlas layer which shows the appropriate section and data from the Allen Reference Atlas (ARA). The Allen Reference Atlas has become the standard high-resolution anatomic reference atlas accompanied by a systematic, hierarchically organized taxonomy of mouse brain structures created by the Allen Institute for Brain Science. The other layers are for each type of label used in the case study. A lot of important information for each section is displayed when you mouse over the blue information button “i” to the left of the case study number including the section coordinates. The section controls are grouped along the bottom of the iConnectome Viewer. The sagittal view of the brain at bottom left has a yellow vertical bar you may drag right and left to show sections from different coronal planes. The data layer buttons above the brain are the same as the data layers provided in each viewport. To the right is an array of coronal sections with the particular section you selected using the vertical bar shown with a yellow outline. You may click on a different coronal section and it will be outlined in yellow and the yellow vertical bar in the sagittal section at left will reposition appropriately. The viewport and menu tool bar display along the top of the iConnectome Viewer. At left, above the navigation controls, are the buttons that control the layout of the viewports. From left to right they are the single, double, 2×2, and tab viewport layout. The button to the right of the four viewport buttons is very important. It’s the synchronize viewports button. When synchronize is activated, any navigation action performed in one viewport is mirrored in the others. Figure 4. 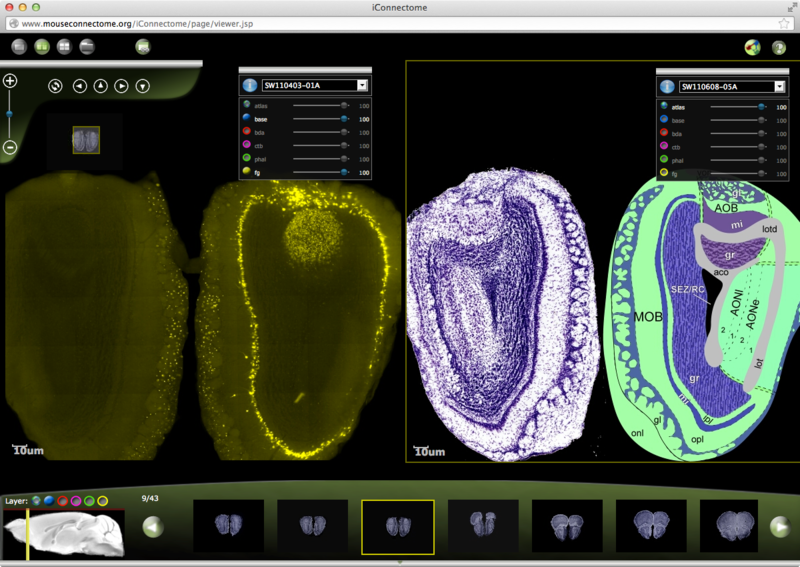 The Mouse Connectome Project’s data repository paired with the iConnectome Viewer provide a powerful mouse brain atlas for the 21st century. It’s time for you to take a test drive. Click on the Dual View button in the viewport tool bar at top left. Now click on the Link Viewports button. Move the vertical yellow line to the right in the sagittal brain section at bottom left. The sections in the left and right viewports synchronize. In fact, they’re exactly the same because the data layers are both set to base. To make this more interesting, in the right viewport click on the base button in the data set and layer controls area. The section should disappear. Click on the atlas button. Now the right viewport should display the exact same part of the brain displayed in the left viewport except the section at right is from the Allen Reference Atlas and it includes a diagram with structure names. Zoom in to take a closer look by double clicking in the viewport or by using the slider in the navigation area. 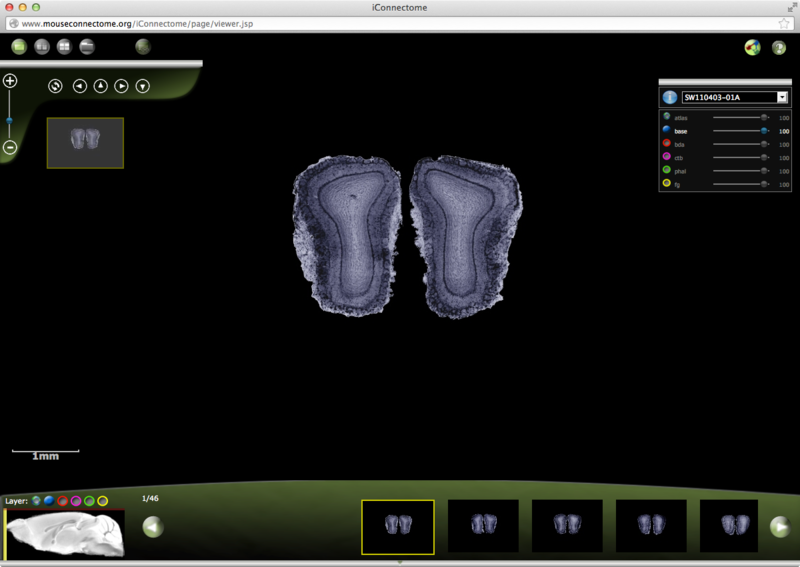 Make this even more interesting by selecting the fg (Fluorogold) data set in the left viewport. Your iConnectome Viewer should look similar to the one pictured in Figure 4 above. The Mouse Connectome Project’s whole brain connectivity atlas and iConnectome Viewer combine to provide a powerful mouse brain atlas for the 21st century. The main shortfall that I see is the apparent inability for public access of the raw data in the repository. Access to the raw data is essential for investigators to be able to go beyond the atlas and to using machine processing to quantitatively analyze mouse brain connectivity. This entry was posted in Brain Science and tagged Brain Science, Open Data Repositories, Semantic Web on November 10, 2012 by Donald Doherty. Figure 1. Antidepressant drug effects (red line) are flat across the severity of patient depression (x-axis). 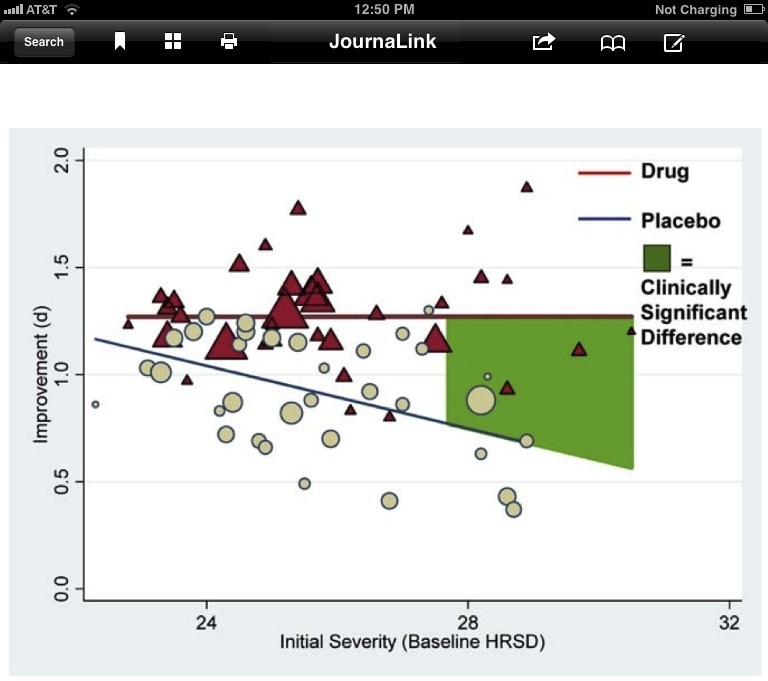 In contrast, placebo effect (blue line) decreases as the severity of depression increases. From Figure 3 in “Initial severity and antidepressant benefits: a meta-analysis of data submitted to the food and drug administration” (published February 2008 in PLoS Medicine). The article is being displayed in iPad using JournaLink version 1.5. Current controversy surrounding the research, marketing, and the United States Food and Drug Administration (FDA) approval of prescription drugs points towards some of the benefits of open data (see note below for some general references). One piece of the controversy revolves around the question of whether or not the FDA approval process is working. That is, does the FDA approval process protect the consumer from ineffective or potentially harmful products? A paper published a few years ago presented the reanalysis of data submitted to the FDA that led to FDA approval of four major antidepressant drugs for market. The authors of “Initial severity and antidepressant benefits: a meta-analysis of data submitted to the food and drug administration” (published February 2008 in PLoS Medicine) had to use the Freedom of Information Act to get “all publicly releasable information about the clinical trials” for fluoxetine (Prozac), venlafaxine (Effexor), nefazodone (Serzone), paroxetine (Paxil), sertraline (Zoloft), and citalopram (Celexa). These are all selective serotonin reuptake inhibitors (SSRIs) that are thought to work by making more serotonin available to postsynaptic neurons. Interestingly, the data disclosed by the FDA was not sufficient to analyze the effects of sertraline (Zoloft), and citalopram (Celexa) and the authors were unable to fill the gap with data from pharmaceutical companies or the published literature. Results of the meta-analysis on the four other drugs fluoxetine (Prozac), venlafaxine (Effexor), nefazodone (Serzone), and paroxetine (Paxil) was presented. The authors ran across other problems with the data. Sometimes discrepancies appeared between published versions of the data and those data provided by the FDA. In addition, they found that a pharmaceutical company would occasionally publish a trial more than once “with slight discrepancies in the data between publications.” When these discrepancies appeared the authors used the data submitted to the FDA. The results of the meta-analysis found that the overall effect of these antidepressant medications was below recommended criteria for clinical significance. They also found that the clinically significant effect found for extremely depressed patients was due to a decrease in the response to placebo rather than an increase in the response to medication (see Figure 1 above). Clearly data should be readily available so that third parties may reanalyze data relevant to the health and well being of millions of people. More eyes and brains working on and reviewing data will help everyone to understand those data better. Our understanding of how many of the body’s processes work is incomplete at best and often provisional. This is especially the case with our understanding of the brain. Let’s speed our understanding by making clinical trial data publicly available. Everyone will benefit, including pharmaceutical companies. This entry was posted in Brain Science and tagged Brain Science, JournaLink, Open Data Repositories, Psychology on December 11, 2011 by Donald Doherty. Figure 1. A basket cell interneuron in simulated cerebral cortical tissue from Figure 11 in “An ultrascalable solution to large-scale neural tissue simulation” (published September 19, 2011 in Frontiers in Neuroinformatics). Below the basket cell, traces of electrical activity from its dendrites are displayed. The article is being displayed in iPad using JournaLink version 1.4. The incorporation of structural constraints is a critical factor in neural tissue simulations. They guide the arrangement in synaptic connectivity of simulated compartments that make up the component neurons and, ultimately, the neural tissue. These are the same constraints placed on real neural tissue. Simulations that adhere to these real world constraints have the potential to provide insights into the functioning of real brain tissue. The paper reports on large-scale simulations of cerebral cortex including 1 million neurons comprised of 1 billion compartments and connected through 10 billion conductance-based synapses and gap junctions. The neurons were derived from the morphology data of real neurons accessed at the public neuromorphology data repository NeuroMorpho.org. A significant feature of the reported neural tissue simulations is the use of complete compartment models of axons. 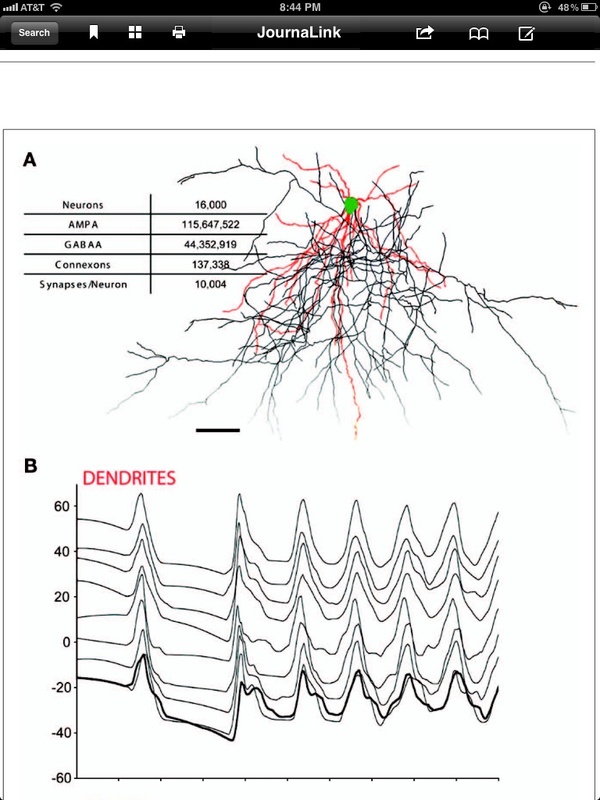 The traversal of electrical current and action potentials are not only simulated across the dendrites and cell bodies but also along axon branches. This enables realistic modeling of action potential failures and conduction times. Clearly simulations of this detail and scale need special machinery. The research team is from IBM’s T. J. Watson Research Center so, not surprisingly, they used the second generation Blue Gene supercomputer known as Blue Gene/P. Nevertheless, these simulations demanded computational ingenuity which takes up much of the discussion in the paper. The Neural Tissue Simulator utilizes what appear to be proprietary technologies known as Model Definition Language (MDL) and Model Graph Simulator (GSL). Note: The authors provide MDL and GSL scripts and other files for creating and running the largest simulation reported in the paper. You may download them from the supplemental data link available at the paper’s website. The authors also say they’d like to share the Neural Tissue Simulator software and source code. The current paper is the first report of simulations of more than one million neurons. The work demonstrates the computational feasibility of human brain scale neural tissue simulations within the next decade or so. To actually accomplish the feat, of course, more than computational capabilities will need to be met. For one thing, knowledge of connectivity in the human brain is far from complete. What will the relevant question or questions be when we do run these very large-scale brain simulations? This entry was posted in Brain Science and tagged Brain Science, JournaLink, Open Data Repositories on November 30, 2011 by Donald Doherty.